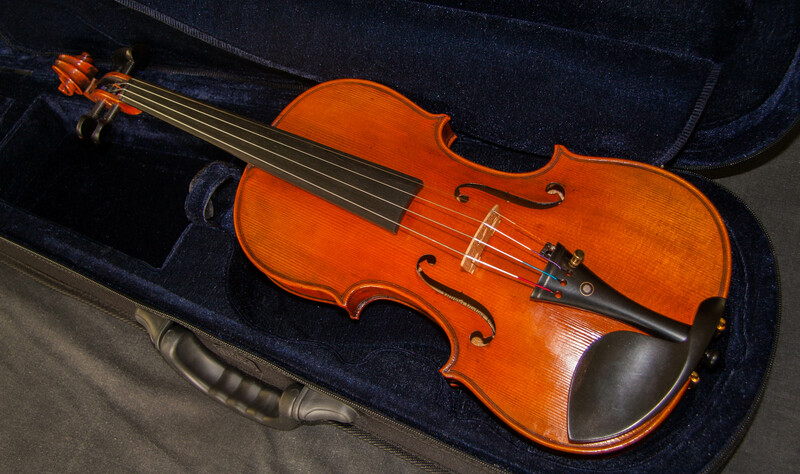 Here we have a very fine new violin, modelled on one of the most famous violins made by Antonio Stradivari, the ‘Dolphin’ Strad of 1714. This violin has an unusual reverse flame back and already possesses wonderful tone that will continue to improve as opens out over the coming months. It is finished in a classic antiqued oil and spirit varnish and is fitted with a high quality bridge. 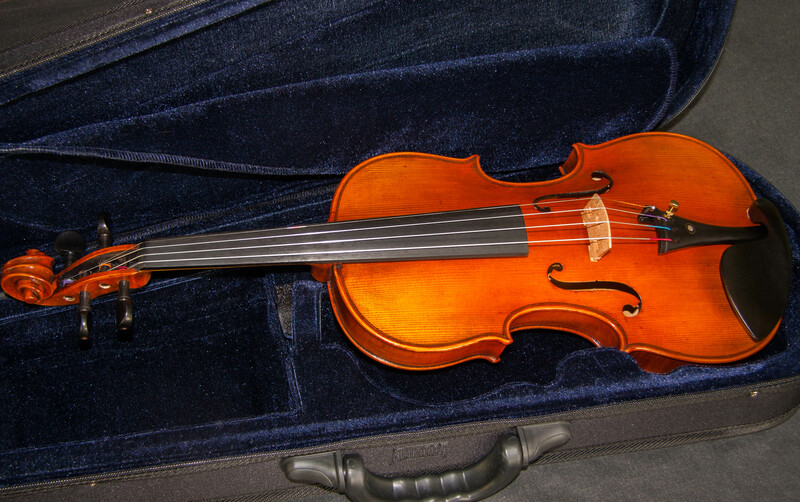 SKU: TAS19005 Categories: New Violins, Violins. 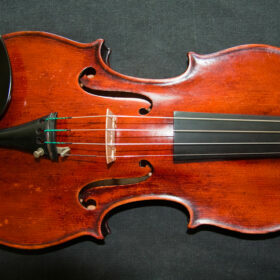 Tags: Antonio Stradivari, new violin, Stradivarius, Stradivarius model, violin. 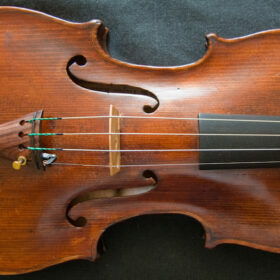 This violin already performs wonderfully well for a new violin. It has a beautiful refined tone and good response. 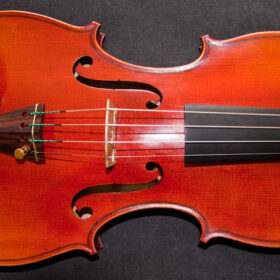 Like all of our violins it is set up not only with tone in mind but also that it has an ease of playing. 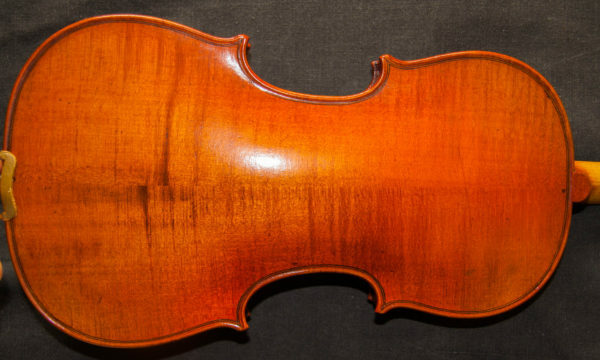 The maple on the back is chosen more with tone in mind than aesthetic qualities. Heavily flamed maple is always a compromise in that its beauty does not confer the very best tonal properties available. 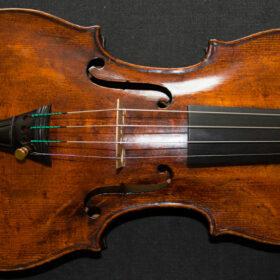 This violin is modelled on the famous ‘The Dolphin’ or ‘Delfino’ once owned by the great Jascha Heifetz and was made by Antonio Stradivari in 1714. 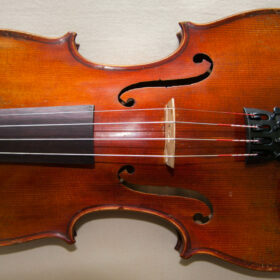 It has been referred to as one of the top 3 violins made by Stradivari, along with the 1715 Alard and the Messiah of 1716. 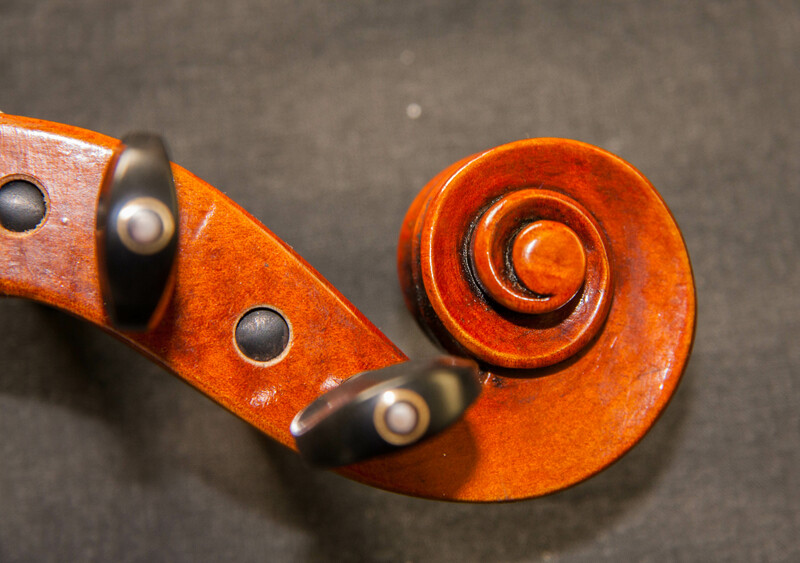 Our luthiers have crafted this violin using quality tonewood with careful attention to plate graduation and perfect arching. This is a beautiful violin made with high quality spruce and maple, which has been air dried for over 12 years, and finished in an antiqued varnish. It comes ready fitted with a high quality bridge. The tone is already excellent for a new violin and after a few months playing you will have an amazing sounding instrument, which with careful attention to setup to optimize playability will be an absolute joy to play. 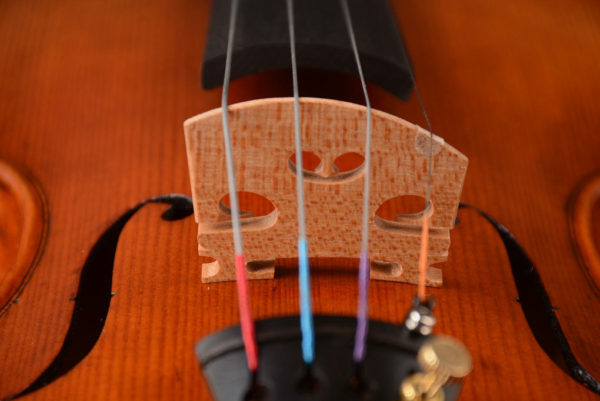 The excellent craftsmanship is followed up with careful set up to ensure that this violin not only has a wonderful tone but also the highest order of playability. Unlike many companies, and especially those imported from China, we ship to you with the bridge in place – this ensures that our high quality set up is maintained, so that you can take it straight out of the box, tune it and immediately start enjoying its wonderful ability to make music. This violin comes with a free upgrade to Pirastro Tonica strings but we believe that wonderful violin deserves the best quality strings, Evah Pirazzi which we will fit at the below cost price of only £55 if you Contact Us to upgrade. 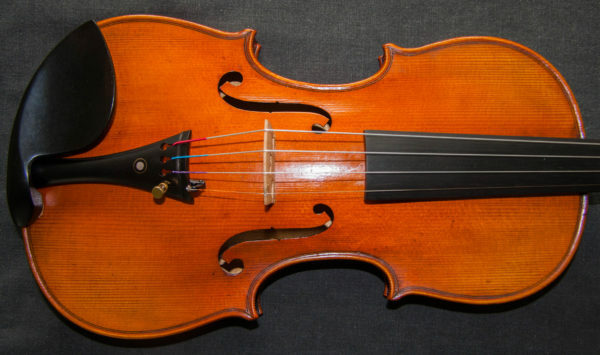 The original violin upon which this instrument is based was completed Antonio Stradivari in 1714, during the peak years or Golden Age of his instrument making, when his powers were at their highest having garnered the fruits of 50 years of violinmaking but before the decline of old age had set in. Violinmaking was still profitable and Stradivari was able to use the prices he could command to utilize the very best wood available in production. 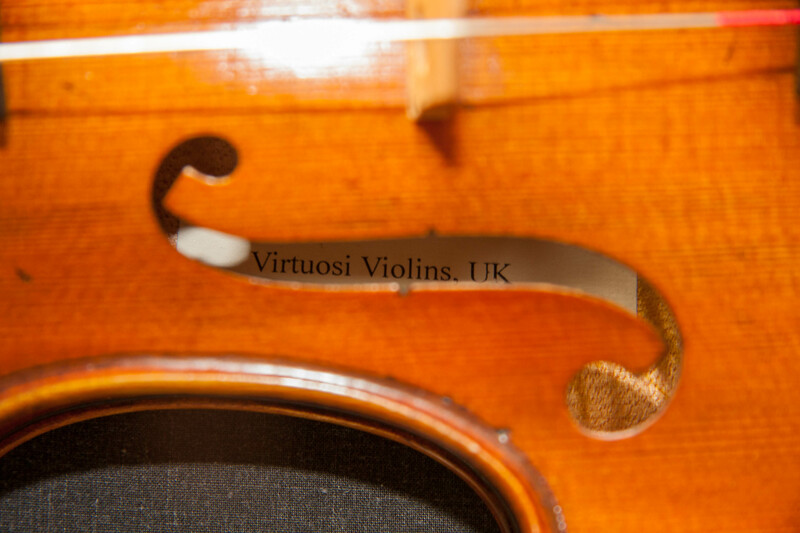 All his most famous violins were produced during this decade, now bearing such as The Messiah, Titian, Alard, Soil, Viotti ex-Bruce, Cremonese, Gibson ex-Huberman, Lipinski and many many more. Although not the first known owner of this instrument, it gets its name ‘The Dolphin’ or ‘Delfino’ from its late 19th century owner George Hart who thought that the appearance and colour of its back reminded him of a dolphin. 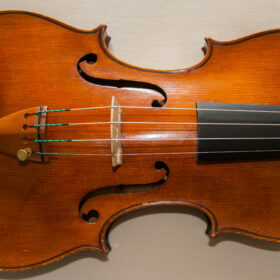 The violin’s most illustrious owner though was the great Jascha Heifetz, probably the greatest violinist who has ever lived, who acquired it in 1951. His preference however remained for the Guarneri del Gesu violin that he had long possessed. 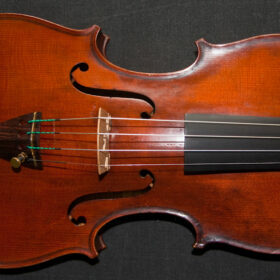 The Dolphin Strad is currently owned by the Nippon Music Foundation of Japan, who have loaned it to Akiko Suwani to use.